The domain within your query sequence starts at position 2346 and ends at position 2414; the E-value for the efhand_Ca_insen domain shown below is 2.37e-27. EF hands are helix-loop-helix binding motifs involved in the regulation of many cellular processes. 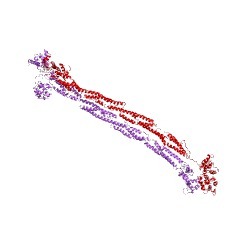 EF hands usually bind to Ca2+ ions which causes a major conformational change that allows the protein to interact with its designated targets. 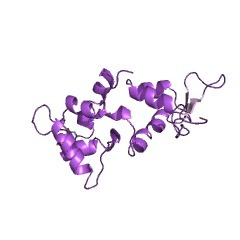 This domain corresponds to an EF hand which has partially or entirely lost its calcium-binding properties. The calcium insensitive EF hand is still able to mediate protein-protein recognition (PUBMED:11573089). There are 3751 efhand_Ca_insen domains in 3743 proteins in SMART's nrdb database. Taxonomic distribution of proteins containing efhand_Ca_insen domain. This tree includes only several representative species. The complete taxonomic breakdown of all proteins with efhand_Ca_insen domain is also avaliable. Click on the protein counts, or double click on taxonomic names to display all proteins containing efhand_Ca_insen domain in the selected taxonomic class. 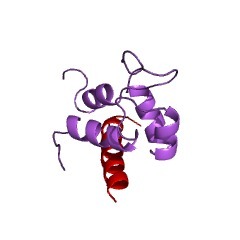 Ca2+-independent binding of an EF-hand domain to a novel motif in thealpha-actinin-titin complex. 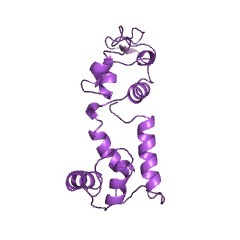 The interaction between alpha-actinin and titin, two modular muscle proteins, is essential for sarcomere assembly. We have solved the solution structure of acomplex between the calcium-insensitive C-terminal EF-hand domain ofalpha-actinin-2 and the seventh Z-repeat of titin. 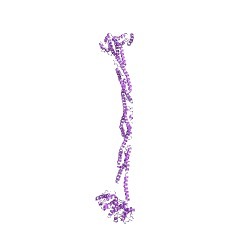 The structure of the complexis in a semi-open conformation and closely resembles that of myosin light chains in their complexes with heavy chain IQ motifs. However, no IQ motif is present inthe Z-repeat, suggesting that the semi-open conformation is a general structural solution for calcium-independent recognition of EF-hand domains.